After getting the blinking LED, the next thing to do is experiment with a switch. Besides an on-board LED, the Netduino also comes with an on-board switch, so we can work without extra components. There are two ways to use a digital input-port. As an InputPort, which requires us to constantly check for an input-value ourselves, or as an InterruptPort, which will provide an event when the value changes. I will show code for each. After the output port for the LED is created as in the blink example, the input port is created for the on-board switch. In this case the glitch-filter is turned off, since bouncing of the switch contacts is not an issue here. The pull-up resistor inside the port of the MCU is disabled, since the on-board switch already has a pull-up resistor. More on this later. Important note: since the switch has a pull-up resistor, the value on the port is low/false when the switch is pressed; the value is high/true when it is released. Using an InputPort, as shown above, the code is required to regularly read the input port to check if the switch has been pressed and act accordingly. An easier way is to use an InterruptPort, as shown below. /// Event handler for the onboard switch. ///The port for which the event occurs. ///The state of the switch. In this version, an InterruptPort is created for the on-board switch, again with the glitch filter and the internal resistor disabled. The interrupt mode is set to both edges, meaning that an event is raised when the value on the port changes from low to high and when it changes from high to low. This allows us to respond when the switch is pressed and when it is released. In both cases, the OnInterrupt event is raised, for which a handler is registered. The handler turns the LED on or off depending on whether the switch is pressed or released. In this example, the program enters sleep-mode as soon as the initialization of the ports is done. When an event is raised, the program wakes up, the handler is called and goes back to sleep again. If you want to use your own switch, there are several ways to connect a switch to the Netduino (or a MCU in general), but a common way is shown in the schematic below. As with the LED, you need to combine the switch with a resistor. Not only to restrict the current, but also to prevent a shortcut when the button is pressed. As with the on-board switch, because a pull-up resistor is used, the value at the port is high when the button is not pressed, and the value is low while the button is pressed. 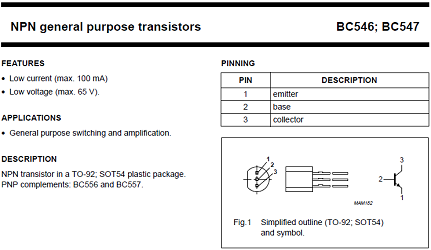 Next: getting started with transistors. One of the things I'm missing in Team Foundation, is an easy way to prioritize and plan workitems (user stories, tasks, bugs, etc.). The easiest way right now, is to open a workitem query in excel and edit the priority of each workitem. But that's not really easy. You need to change the priority field, making sure to provide a correct value that will put the workitem in the right position priority-wise. If you managed to pick the correct values, you need to sort the workitems; which is a manual action. I would like to be able to drag & drop workitems in the correct position in the list. I don't care about the exact value of the priority field. I only care about the order in which the workitems show when they are sorted by priority. I would also like to be able to easily plan workitems, by moving workitems into (or out of) a specific iteration path. In my case that would be the product backlog and several sprint backlogs, but the functionality should be applicable to all process templates. Finally, I would like to have some sort of status- or scrumboard. Each possible status for workitems is a column on the board and each workitem is represented by some form of card. By moving a workitem card into a specific column, the status of that workitems changes accordingly. We use physical (white)boards, with a recent print-out of the sprint burndown in some corner, but they are of course not connected to TFS. I did some research on how to build such functionality and, especially, on how to integrate it into TFS Web Access and/or Sharepoint. I quickly found that TFS Web Access would be the easiest way, for me at least :-P. Last month I started a project on codeplex: TFS Scrumboard. Below is a short description and a screenshot. 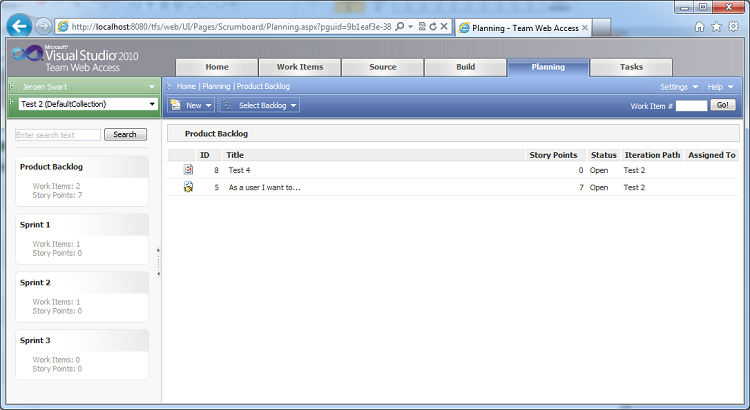 TFS Scrumboard is an extension to TFS 2010 Web Access, providing easy planning and managing of workitem progress. TFS Scrumboard is build (in C#) as an extension to TFS 2010 Web Access. It is designed to be used in scrum projects, using one of the many scrum process templates available. I use my own custom scrum process template, to support the way we do scrum projects, but no dependency on any kind of process template is assumed. When installed, TFS Scrumboard provides two extra tabs in TFS Web Access: Planning and Tasks. The Planning tab is meant for planning and prioritizing workitems. It shows the product backlog and each sprint backlog on the left side, and the workitems in a selected (product/sprint) backlog on the right side. A workitem can be planned by moving it to (dropping it on) a specific sprint backlog or removed from planning by moving it to the product backlog. A workitem can be prioritized by dragging-and-dropping it in the desired position inside a (product/sprint) backlog. The Tasks tab is meant for managing the progress of workitems during a sprint. It shows vertical swimminglanes which represents one or more statusses of the workitems in a specific sprint. The status of a workitem can be changed by dragging-and-dropping it in the desired swimminglane. A workitem can be prioritized by dragging-and-dropping it in the desired position (vertically). The version control part of our process template is the same as both the MSF for Agile and the Microsoft Scrum templates. Multiple check-out is enabled, because there is no reason to disabled it. Any conflicts can easily be resolved using the tools available in Visual Studio, most of the time even automatically. In some instances however, like when refactoring a lot of code, you may consider checking out the affected files with a check out lock. This is still possible with multiple checkouts enabled, but you need to check-out the file(s) manually and select the ‘Check Out’ Lock type. Get latest on check-out is disabled, because I want control over when the latest version is downloaded. I get the latest version before I start changing any code, but I don’t want any changes on the server to interfere with my coding work while I’m coding. I’d rather resolve any issues once, during check-in, instead of every time I check out a file. Of course, if I need changes made by others, I will get the latest changes, but I’ll decide when. I didn’t define any check-in policies. Of course everybody should provide comments, associate with work items, run code analysis and make sure the code builds before check-in. But we’ve decided not to make them policies and let them prevent from checking in. One reason is that, although a policy can check if certain information (like comments or a work item) is provided, a policy can’t check if it is meaningful. So these things will be monitored and if a team member is not providing the required information, we will explain why it is important and help to provide the right and meaningful information. I also didn’t change the check-in notes. I’ve not used them yet and don’t expect to use them in a scrum project, but decided to leave them in. The above mentioned settings are the default in the process template, but can of course be changed in a specific team project if there is a need to do so. And if there is a very good reason to do so, we can even change the process template :-). Branching and merging is an important part of version control, but not a part of the process template. Based on the Branching guide from the ALM Rangers (http://tfsbranchingguideiii.codeplex.com/), we have decided upon a strategy that will allow us to start simple, grow as we need and even take different approaches if required. Below are the basic choices, where the simplest workable solution is the best. Always start with a Main folder and make it a branch. For very small projects, this could be the branch where development takes place. Only if maintenance is needed on a released version, a new release branch is created using the label that was created during the build of that particular version. Create separate development branches for multiple teams, or small projects if working in the Main branch is making that branch unstable. Always create a container folder that holds all the development branches, even if there is (currently) only one development branch. Forward and reverse integration with the Main branch is done as much as possible, to minimize the amount and complexity of conflicts. Release branches, as already mentioned, but also branches for hotfixes, service packs and other maintenance work are only created when necessary. Such branches can easily be created using the label of the build related to the version requiring maintenance. The complexity of the total branch structure really depends on the project and we use the branching guide as a guideline. It has been a while since my last post, but I’ve been very busy. I’ve setup a fresh TFS 2010 environment at Quintor and customized it to our needs. I created a custom process template, a custom SharePoint site definition and custom build activities, to name a few. In this and some following posts, I would like to share what I’ve done. Of course, to be able to edit the process template, I’ve installed the TFS Power Tools. The latest version (now March 2011) can be downloaded from the Visual Studio Gallery. Since we use Scrum for all our projects, I decided to start with the Microsoft Scrum template (also available in the Visual Studio Gallery). Some parts I left as it is, other parts I’ve changed to fit our process and needs. And I’m sure some more things will change (or change back) once we have more projects done using this template. Test and Lab management are missing because I haven’t touched them yet. As soon as I do, and I will :-), I will add those to the list. For a current project I needed a 64 bits virtual environment and decided to use VMware Player (3.1.2). All went well untill I tried to access the web from the VM while working at home using my wireless LAN. I had no problem accessing the internet during the first part of the install, but that was at the office and probably hardwired to the LAN. In the created 'extract' folder, locate the 'network.cab' file and open it. From the 'network.cab' file, copy the 'vmnetcfg.exe' file to the VMware Player installation folder (in my case: C:\Program Files (x86)\VMware\VMware Player). Start the Virtual Network Editor (vmnetcfg.exe) from the installation folder; you could add a shortcut to the start menu for easy access. Now you can select or restrict the network adapters to be used by the bridged adapter from within your VM.